White River Knives FC5 ($280) is designed for heavy use in real survival situations these also make excellent camp, hunting, backpacking or utility knives. The deep finger choil protects fingers while applying pressure whittling, cutting or chopping. Atop the blade is a notch for efficient striking of a ferro rod and one is included with each knife. Features a polished stainless steel divot for use with a fire bow. This is a well-designed, great looking, and robust knife intended for serious work. 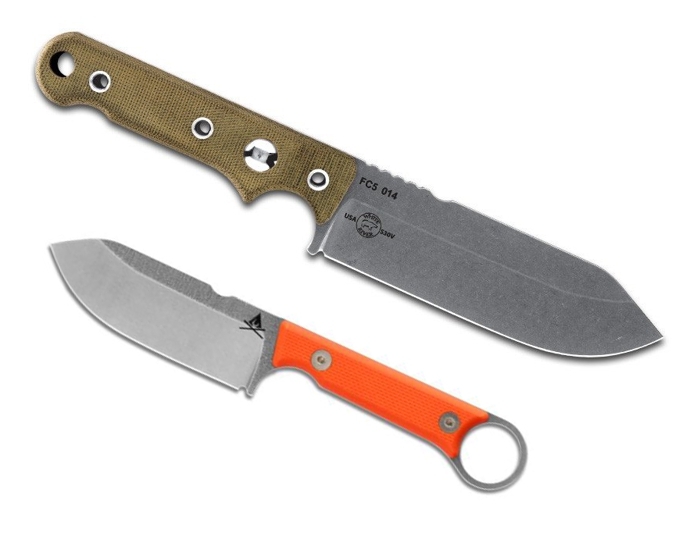 The White River Knife & Tool FC3.5 - PRO - Orange Textured G10 ($135) is designed for heavy use in real survival situations, this knife stands alone or makes an excellent companion knife to the larger knives in the series. It's compact enough to allow for every day carry, camp, hunting, backpacking or utility knives. Atop the blade is a notch for efficient striking of a ferro rod, and one is included with each knife. The smallest of the FIRECRAFT series, the FC3.5 Pro has pre-fastened, removable bolt-on textured G10 handle scales to allow for a rugged grip and versatility.